Rev A of the LCD-IO Expansion Cape is running (mostly). I screwed up the CAM job when I sent the gerbers into the board house. Some inner power traces were missing, but I was able to work around that. Needless to say, Rev B is being built this week. I was able to verify all the components worked as designed and that the cape mated with the Beaglebone correctly. No pictures of the completed Rev A hacked up board, but I will post images of the Rev B cape populated and running on a Beaglebone with both the Optrex 5 inch 800×480 and the Newhaven 3.5 inch 320×240 displays. I am using the basic Angstrom distribution and customizing the pin muxing in the board file for 24 bit color, SPI0 and SPI1, UART1 and UART4. In the upper right corner of the image of the cape, the 8 pin socket is for the AT24CP EEPROM and it is recognized during boot. 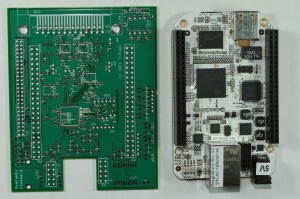 In the lower left side of the image (to the right of the Ethernet connector cutout) is where the coin cell battery holder is located (bottom side of board). This battery is used to keep the NXP PCF2127A RTCC alive when power is removed from the system. The RTCC is located in the lower right corner. All UART signals and GPIO from the Beaglebone and PIC are routed to 2mm connectors on the board and to the DB25 Female connector seen in the image top left next to the 8 pin dip where the EEPROM is located. The board dimensions are such that it fits into a custom aluminum extrusion with slots on the inside where the cape will snuggly slide into. The Beaglebone is then carried by the Cape inside this enclosure. Gerbers for my 1st BeagleBone Cape went to the board house yesterday (12/15/11), received word this afternoon the files were without error and processing has begun. Should be ready by Thursday next week and in my hands ready for assembly the day after Christmas. This Cape is a generic LCD TFT display and IO expander board. It has one of the new Microchip PIC32MX120F032D chips used as an auxiliary processor for IO and communicates with the BeagleBone via SPI. 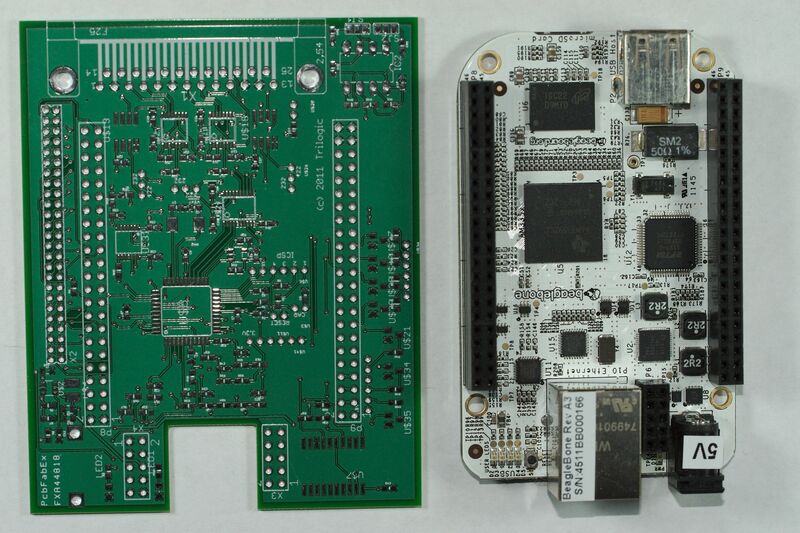 In addition, a NXP PCF2127 RTCC with battery backup is installed and communicates with the PIC(tm) via I2C.